As I grow up, my goals keep on changing. When I was 13, I wished to represent Hong Kong at World Junior Tennis and to become the best in my age group. 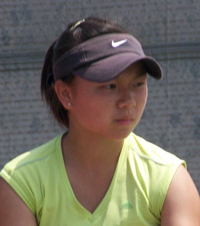 When I was 15, I desired for a spot on the Junior Fed Cup team and to perform well in international tournaments. When I was 17, I wanted to play college tennis. With Benny’s guidance, my goals turned into reality. If it wasn’t him, I wouldn’t be here right now- attending university in the States and continue being a student athlete. Throughout the whole college recruiting process, Benny not only introduced me to a lot of coaches from various types of institutes, but he also taught me to find the right college for myself. Sometimes it’s not about getting into the best college, but is about being the best individual you can be. Through being a student-athlete, I have developed my independence, patience and persistence; through playing tennis, I have benefited to excel as a person with both training of the body and the mind. Studying and playing at California State University, Northridge, a NCAA Division 1 school, will surely keep a balance between my academics and athletics career. Without Benny’s assistance, I would be somewhere else right now - perhaps staying in my room all day long worrying about my HK A level exams. What I learn from being a student-athlete will surely assist me down the path towards success. I want to take this chance to thank Benny for all these years of inspiration and the opportunities he’s given me!